DUNMORE is one of the world's leading manufacturers of photovoltaic backsheets used in the production of solar panels. With backsheet manufacturing in the US and Europe, DUNMORE has been servicing the domestic and international solar module market for over 10 years. DUN-SOLAR™ backsheets are available in various constructions, and the DUN-SOLAR PPE+ backsheet is a proven and reliable backsheet component used by many solar module manufacturers. DUN-SOLAR PPE+ backsheets have a high performance multi-layer non-fluorinated construction with a hydrolysis resistant and UV stable PET finish layer applied to a polyester core and a PE laminated structure. This polyethylene-based product provides excellent performance in a non-fluorinated film with outstanding UV and hydrolysis resistance for superb electrical, physical, barrier, and thermal properties. DUN-SOLAR PPE+ backsheets protect PV modules from UV, moisture, and weather while insulating the electrical load of the modules, which can operate up to 1500 VDC. These DUN-SOLAR PPE+ capabilities are essential for functionality and longevity of the photovoltaic modules and safety of people who work with and near the PV module. 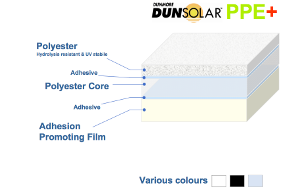 DUN-SOLAR PPE+ is a multi-layered all-polyester film lamination designed to be used as the backsheet for photovoltaic solar panels. It acts as a durable protective barrier for the electronic components found in solar panels. This construction is specifically engineered for use in photovoltaic backsheet applications requiring superb electrical, physical, barrier and thermal properties. 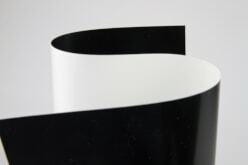 The outer PET layer and the adhesion promoting film provide high white degree and high reflective properties. DUN-SOLAR PPE+ backsheets are UL recognized under file QIHE2, Photovoltaic Polymeric Materials-Component. DUNMORE's ISO 9001:2008 certified manufacturing facilities ensure that products and systems meet the high quality standards required by the photovoltaic industry. Please Contact Us for more information on all polyester construction DUN-SOLAR PPE+ backsheets for solar module manufacturing.